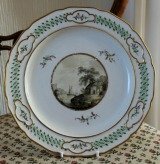 A rare Derby porcelain plate, pattern 204, c.1795, the central circular panel painted, in the manner of John Brewer, with a 'Black on Moonlight' scene, supported by three scattered sprigs, the border with an enamelled and gilt band of floreted green ovals divided by sprigs in quatrefoil panels. Dimensions: 9in (23cm) diam. Marks: crown, crossed batons, dots and D in puce, pattern no 204 in puce, gilder's numeral T. Fine condition, minor ware. 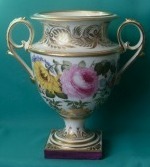 An early 19th Century Derby Porcelain Vase, amphora-shaped with scrolls handles, and moulded and gilded with lion-masks and acanthus leaves, finely painted by William Pegg the Quaker with botanical studies, elaborate gilding, c.1815. Dimensions: 23.5 cm. Red painted marks on the base. Excellent condition. Part Derby Armorial Porcelain Cups Tea/Coffee Set c.1790-1810, comprising two coffee cups, one tea cup, five saucers, two plates painted in the centre with a family crest and initials "B M H" in gilt, together with a similar teacup and saucer painted and gilded with initials "K H". Condition: some ware on the gilding. Painted marks in puce and red. 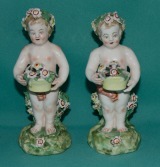 Two Derby figures of putti, late 18th century, each holding a basket of flowers, hand-painted in colored enamels. Dimensions: 15 cm high. Impressed star, number 3 incised. Condition: small chips on the flowers. An Early 19th Century Derby pedestal dish, of navette form, the edge scalloped and decorated with blue borders, foliate sprigs and gilding. Dimensions: width 31 cm. Fine condition. Unmarked. 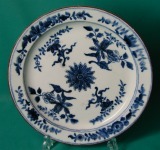 A Rare Derby Porcelain Plate c.1770, painted in underglaze blue with floral motives in Chinese style, the rim coloured in brown. Dimensions: 21.5 cm diam. Condition: a small chip near the rim. A small workmen's mark "5" inside the base rim, painted in brown. A Pair of Derby Porcelain Dancing Figures c.1800, modelled as a gentleman and companion, painted with coloured enamels, standing on rococo style bases with gilt detailing. Dimensions:21 cm high. Marks: No 317 Incised, 5 painted in red. Condition: small chips to bocage and minor restoration. * The incised star on the base is the "repairer's mark for Issac Farnsworth, the foreman of the ornamental department from the time of Duesbury II until he died (1750s-1821). ** The painter's mark "5" in red is for John Yates. 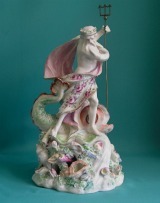 A Derby porcelain figure of Neptune, wearing flowing robes painted with sprays of "Cotton Stem" flowers lined in pink, his right arm raised grasping a metal trident, the other arm across his body holding his robes at his chest, with a dolphin at his side, the base encrusted with shells and coral. c.1760. 23 cm high. Condition: some restoration. Unmarked. A Derby Porcelain Plate c.1775, centrally painted with a rose-garland-strewn vase and butterflies, the border with berried swag pendant, the rim scalloped in gilt. Dimensions: 22cm diam. Marks: crown over D in blue. Fine condition. A Derby named view plate pattern 74 by Zachariah Boreman, painted in monochrome scenes c.1790. Mark in blue, inscription: "View near the Buxton Road Derbyshire" 8.75"(23.3cm) diam. Faint hairline near the rim, some ware. A fine Early 19th Century Derby Porcelain Plate Teapot Stand, decorated with roses on cobalt blue ground, fine gilding. Dimensions: 9.75"( 24.5cm) diam. Marks: painted in red. Condition: some ware on the gilding in the centre. A Collection of three Bloor Derby Dessert Plates c.1825, the pair with border shaped with moulded flower heads picked up in gilt and finely painted with apple-blossoms on a green ground. 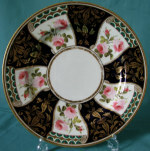 The plate in the middle of similar shape, decorated with roses and birds on blue/black ground. Dimensions: 24cm diam. Marks in red. Condition: minor ware, one plate with a stress line. Rare, early incised mark c.1750-5. Incised Potter's marks. (on hte left: the repairer's mark of Issac Farnsworth, on the right: that of Joseph Hill). Incised mark, found on dishes, rarely on figures, c.1770-80. 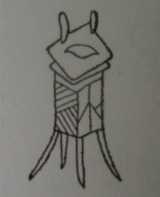 The potter's stool mark, found on Derby pieces, possibly seconds or sold to outside decorators. Painted marks in gold, Chelsea-Derby period, 1769-1775. 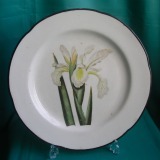 Painted mark c.1830-40, found on pieces, decorated in Sevres style.